Learn More About T&E Stacker Trailers! T&E recently built this 53' Gooseneck Trailer for Brent Kolada who travels around the U.S. and Canada with a mobile on-location surgical instrument repair service. 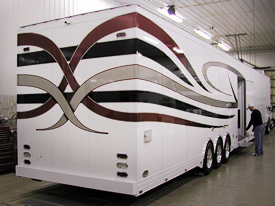 Brent wanted his trailer to be a combination mobile business and RV due to the fact that he is on the road for long periods of time traveling to various medical facilities throughout the year. 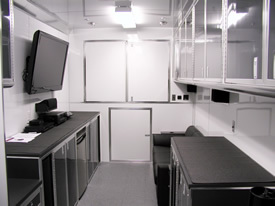 The trailer features separate work and office/living areas and allows Brent to be highly productive in his business travels. Brent put a lot of personal research and planning into exactly what he needed in a trailer and T&E worked closely with him and successfully brought those plans to fruition. One of the main requirements Brent had was that the trailer be insulated to a much higher standard than usual. Brent works in Canada quite frequently and the cold weather there can be brutal at times. To ensure against excessive heat loss T&E doubled the side wall insulation we normally use and also fully insulated the entire floor of the trailer. Interior heat is provided by an OASIS Hydronic heating system unit. For the summer months, chilled, conditioned air is provided by a series of roof mounted air conditioning units. The rear portion of the trailer is a fully equipped surgical instrument repair shop which houses all the specialty tools and equipment that Brent needs to perform his daily work. The fully climate controlled work area also features a JET air filtration system to filter contaminants from the air. Under the main work bench T&E custom built a high powered vacuum system with suction tubes running up to each tool to ensure that debris from the tool restoration processes is contained properly. To make the long days at work more enjoyable, there is a high powered multi-speaker stereo system installed within one of the benches in the work area. 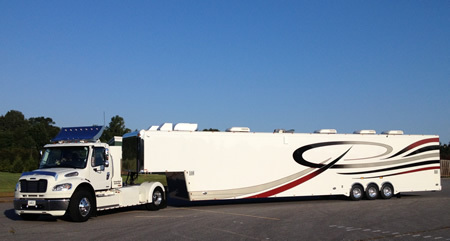 Brent's trailer was custom painted to match his towing vehicles paint job. Feel free to ask us about the optional trailer paint services available to perfectly compliment your tow vehicle or teams colors. T&E also offers custom awnings by Girard, Arrow and other quality manufacturers. Note: T&E has the ability to custom build your trailers living quarters to match whatever level of comfort and convenience you desire. From basic living quarters to a luxurious lounge with all the comforts of home, T&E has the experience and knowledge bring your ideas into reality. Note: Work areas in T&E trailers can be matched to your unique requirements. We welcome your personalized ideas and can custom build most anything you desire.